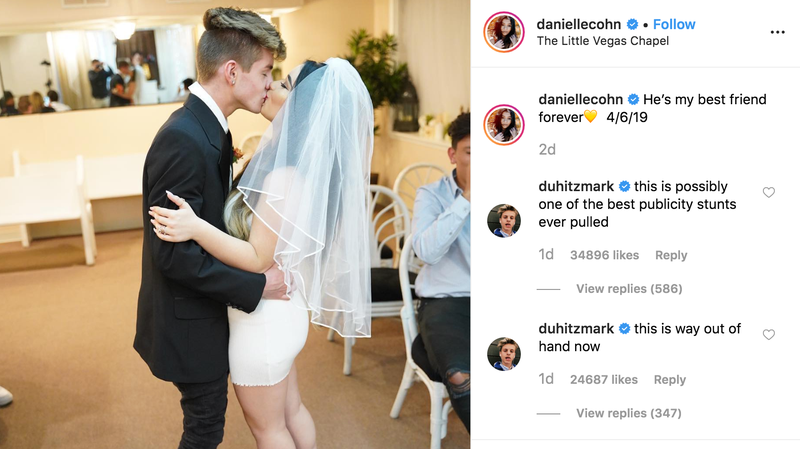 A 15-year-old Musical.ly star-turned-YouTuber named Danielle Cohn pretended to wed her 16-year-old boyfriend and fellow YouTuber Mikey Tua in Las Vegas for a video. They also led their followers to believe she was pregnant with his child in a video on his channel, BuzzFeed reports. On Friday, Tua posted a 18-minute video titled, “We Are Expecting... (Pt. 1/4)” to his channel, in which the teenage couple is seen in a hotel room with some friends, preparing to tell their family that they’re pregnant. It currently has over 3.1 million views. The next day, Cohn posted a nearly 14-minute video titled, “We Got Married...(Pt. 2/4)” to her YouTube channel, where she has over 1.2 million subscribers. In that clip, Cohn and Tua go through what appears to be a pretty legit wedding ceremony at the Little Vegas Chapel, complete with an officiating Elvis impersonator. The video is still up, monetized, and has over 2.5 million views. Danielle’s mom, Jennifer Cohn, assured BuzzFeed the pair aren’t actually married (and because she’s under 16, she’d need her guardian’s permission) but because they never made it explicitly clear that they were joking in either video, they’ve still managed to piss off their followers. Whatever the case, it’s probably not great to tell your child it’s cool to lie about being a teen mom, or teen wife, on the internet for clicks, no matter how much money it pulls in? I am very curious about Tua’s family in all of this: what’s going on there? And most importantly of all: Is YouTube creating a generation of sociopaths? YouTuber Lilly Singh Gets a Late Night Spot, But Will Her Audience Follow Her?